First there was the simple "string of pearls" style browbands, then crystals, then natural beadwork and mesh beads, then interchangeable bands, and all kinds of variations. New browband makers have to set themselves apart, do something different. I bring you new bling sources with edgy, flamboyant, and downright different alternatives to the traditional dressage "conservative attire." Go big or go home! Really good selection, some different kinds of beads like the dichroic luminous kind and some sterling silver choices that are understated and different. Images of the browbands don't do a good job of selling these browbands, but when you take the time to enlarge the photos they are really quite nice. Okay, the ducks and peppers are probably a niche market but there are some here that'll have wider appeal. As a lover of beadwork, I am drawn to this one. I may have featured them before, but this Devon series looks new, and it's striking. Crown Jewels Design -- my favorite! These are simple crystal stones and mesh, in an assortment of leather colors. Okay, this one's my favorite! Great combination of unusual beads and jewels. Not too too fancy, but elegant. Curved browbands, distinctive combination of beading and padding. I'm lovin' this site. I think these examples are very lovely -- unfortunately there are only two examples. Designer does custom work. From major manufacturers, not hand-made, but a good selection and some curved choices. Much of the beadwork is western style but I'd love to get a custom browband from her. Judging from her work she is pretty accomplished. Beautiful, blocky, chunky beads that line up to create high impact and different looking browbands. A cool "wavy" browband, one step beyond a curved browband. On Etsy.com, this artist uses seed beads and does custom work. Love the American flag browband! Really unusual designs! Not everyone will want elephants on their browbands but by golly you'll stand out. A nice selection of flamboyant and elegant designs. Well, without knowing the language (even with the translated pages there are words that are not English), I can only say that there are some different styles here, mostly crystals and jewels, and they are lovely. Major bling, not for everyone, but beautiful handiwork. OK, I admit I'm a nerdy weirdo but I really,really like the ducks! Actually, I like them much better than anything else you put up there. Too hard to choose. I think I like shaped bands the best, however. Wonder how hard they are to make. 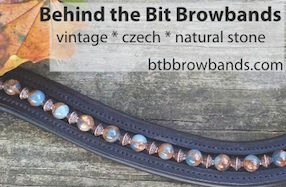 If you bought a plain browband, could you bead or jewel it yourself, I wonder? Might be kind of fun to try. Worth replacing a perfectly adequate browband to the tune of $180 dollars... no. I have to admit, I LOVE the pricess, glittery style ones. I would also wear pink shirts and crystal stock ties if I could.... I LOVE pretty sparkly things, my only dissapointment when I had my child was that he was a boy... if I had a girl, she would never see a pair of pants - unless they were breeches to ride in! oh i love crown jewels design! the woman who makes them is VERY nice and takes a lot of pride in her work. she also makes stock pins that are gorgeous as well. If you want a custom brow band/ pin, she will make that for the same price. sorry, dont mean to advertise, but, really, a great company!